Aqua Dream Day Cream Protector is designed for intensive hydration, protection and recovery of the skin. It is composed of natural herbal ingredients that help keep your skin beautiful and well-groomed. Soft, balanced formulas allow us to maintain the natural moisture level, reduces wrinkles caused by dryness, promote skin protective forces. 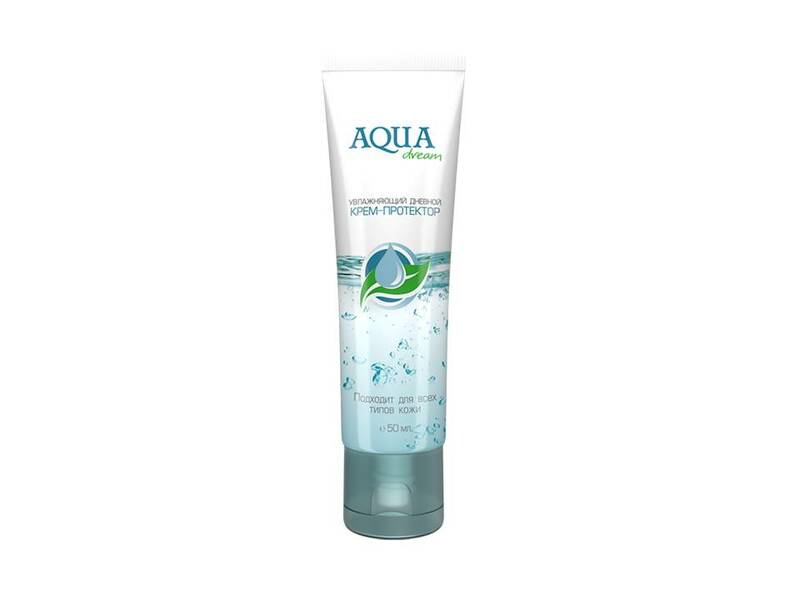 Regular care with Aqua Dream products gives the skin a smooth and strengthens its natural protection against external influences.Brimming with life-giving moisture, the skin becomes smooth, soft and radiant. Easy comfortable day cream formula Protector perfectly refreshes and moisturizes the skin throughout the day. Cucumber extract , included in its composition, due to its rich chemical composition, restores the skin's moisture balance, providing long-term moisturizing effect. A special antioxidant complex, composed of herbal extracts of horsetail, ginseng, green tea, normalizes metabolism in the skin, combats premature aging, has a calming effect. Note: suitable for all skin types. Aqua, glycerin, sodium polyacrylate (and) dimethicone (and) cyclopentasiloxane (and) trideceth-6 (and) PEG / PPG-18 / dimethicone, caprylic / capric tridlyceride, cucumis sativus extract (akofruit cucumber HGL / PF), betaine , phenoxyethanol, ronasphere LDP (silica, titanium dioxide. iron oxides), hydroxyethyl acrylate / sodium acryloyl dimethyl taurate copolymer, hydrogenated castor oil, disodium EDTA, eguisetum arvense extract, panax ginseng root extract, camelia sinensis extract, parfum. Apply in the morning to cleansed face, neck and décolleté with light massaging movements. It is an excellent base for make-up.